JOINING THE CAST FROM MONDAY 5th SEPTEMBER 2016 ARE SIÔN LLOYD AS ‘MONSIEUR FIRMIN’, MARK OXTOBY AS ‘MONSIEUR ANDRE’, PAUL ETTORE TABONE AS ‘PIANGI’ and DAISY HULBERT AS ‘MEG’. As the immensely popular Andrew Lloyd Webber musical The Phantom of the Opera London heads towards its 30th Birthday at Her Majesty’s Theatre in the West End; Ben Forster continues to star as ‘The Phantom’ alongside Celinde Schoenmaker as ‘Christine Daae’ and Nadim Naaman as ‘Raoul’. Joining the cast from Monday 5 September are Siôn Lloyd as ‘Monsieur Firmin’; Mark Oxtoby as ‘Monsieur Andre’; Paul Ettore Tabone as ‘Piangi’ and Daisy Hulbert as ‘Meg’. Also continuing their roles are: Megan Llewellyn as ‘Carlotta’ and Jacinta Mulcahy as ‘Madame Giry’. Harriet Jones returns as alternate ‘Christine Daaé’. Celinde Schoenmaker most recently played the role of ‘Fantine’ in “Les Misérables” at The Queen’s Theatre, having made her West End debut in 2013. Previously she played ‘Jenny’ in a production of “Love Story” which toured Holland. Siôn Lloyd is currently appearing in “Titanic” at the Charing Cross Theatre. His other recent theatre credits include: “The Bodyguard” on tour; “The Pajama Game” at the Shaftesbury Theatre; “Avenue Q” at the Noel Coward Theatre and “The Full Monty” at the Noel Coward Theatre and UK tour. Paul Ettore Tabone’s previous theatre credits include “Love Never Dies” at the Adelphi Theatre and at the Hamburg Stage Operettenhaus. In 2013 Paul was accepted as a ‘Young Artist’ in the prestigious Luciano Pavarotti Foundation of Modena; performing with Placido Domingo and Andrea Bocelli at the Arena in Verona, Italy. He made his professional operatic debut in 2014 in Verdi’s “Rigoletto” at the Opera Națională Bucureşti. Megan Llewellyn most recently performed the role of ‘Berta’ in “The Barber of Seville” for Welsh National Opera. Her previous opera roles include Antonia in “The Tales of Hoffmann” for Guildford Opera; “Cosi fan Tutti” for Eastern Opera; “Ariadne auf Naxos” for St John’s Smith’s Square and “Scenes from the Savoy” for Opera Brava. From 5th September 2016 the full cast will be: Matt Blaker; Bridget Costello; Maria Coyne; Scott Davies; Hadrian Delacey; Morven Douglas; Ben Forster; Lyndsey Gardiner; Lori Gilchrist; Ryan Goscinski; Philip Griffiths; Hettie Hobbs; Grace Horne; Lily Howes; Daisy Hulbert; Ellen Jackson; Harriet Jones; Richard Kent; Tim Laurenti; Adam Robert Lewis; Megan Llewellyn; Siôn Lloyd; Luke McCall; Leo Miles; Fiona Morley; Tim Morgan; Paul Morrissey; Jacinta Mulcahy; Nadim Naaman; Mark Oxtoby; James Roxby-Brown; Celinde Schoenmaker; Tom Sterling; Joanna Strand; Paul Ettore Tabone; Claire Tilling, Charlotte Vaughan; Victoria Ward and Georgia Ware. The Phantom of the Opera became the longest running show in Broadway history on 9 January 2006 when it celebrated its 7,486th performance, surpassing the previous record holder “Cats”. This coincided with the Broadway and the US national touring company celebrating an unprecedented 20,000 performances in the United States. On 26 January 2013 the Broadway production celebrated an amazing 25 years on Broadway. In October 2011 the London production celebrated its 25th Anniversary with a spectacular staging of “The Phantom of the Opera at the Royal Albert Hall” which was screened live in cinemas all over the world and subsequently released on DVD and in August 2015 the show celebrated 12,000 performances in the West End. The Phantom of the Opera has won over 70 major theatre awards, including seven Tony’s on Broadway and three Olivier Awards in the West End. It won the ‘Magic Radio Audience Award’, voted by the public, in the 2016 Laurence Olivier Awards. 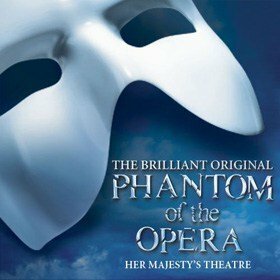 THE PHANTOM OF THE OPERA, which opened at Her Majesty’s Theatre on 9 October 1986 starred Michael Crawford as ‘The Phantom’ and Sarah Brightman as ‘Christine.’ It is produced by Cameron Mackintosh and The Really Useful Theatre Company Limited. The Phantom of the Opera became the first stage production to reach worldwide grosses of $6 billion, which it did last summer. Revenues far surpass the world’s highest-grossing film “Avatar” (at $2.8 billion), as well as such other blockbusters as “Titanic”, “The Lord of the Rings”, “Jurassic Park” and “Star Wars”. Worldwide, a staggering 140 million people have seen THE PHANTOM OF THE OPERA in 35 countries and 160 cities in 15 languages. The Phantom of the Opera is currently showing in London, New York, Budapest, Prague, Oberhausen and on tour in the US. THE PHANTOM OF THE OPERA will open in Stockholm in September and in Paris in October.